TL; DR: Customers place their faith in businesses every time they hand over credit cards or other personally identifiable information during transactions. But if customer confidence becomes broken at any point, it can have a devastating impact on a business’ bottom line. Downloaded more than 55 million times since its initial release in 2006, SUPERAntiSpyware specializes in protecting computers from malware and other threats, keeping data out of the hands of cyber criminals. Its business platform gives IT departments a central management console they can use to scan and monitor every endpoint within a company’s infrastructure. SUPERAntiSpyware for Business is an affordable and lightweight security solution, giving businesses peace of mind that their customer data is safe. Businesses face an endless barrage of malware as cyber criminals seek out vulnerabilities in systems to launch ransomware attacks that threaten brand reputations. 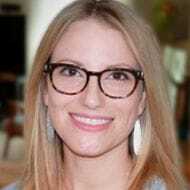 Customers trust companies to keep their data out of the hands of those trying to steal their personal information, and one negative headline can cause irreparable damage. 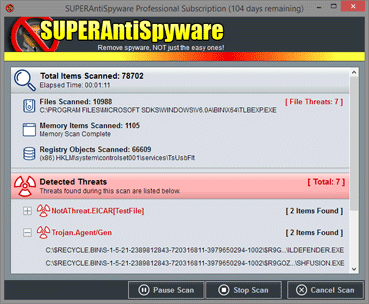 The SUPERAntiSpyware team has spent more than 10 years improving the scanning engine it uses in the free, pro, and business editions of its security platform. The software product has been downloaded more than 55 million times and was purchased by Support.com in 2011, which is fitting because the team has benefited from the backing it receives from its parent company’s investment in the platform. “We’ve been working on the technology for more than 10 years, and we’ve continued within Support.com to do the same thing that we’ve always done, which is launching an active response to emerging malware,” said Geoff Bullard, Senior Software Engineer II at Support.com. SUPERAntiSpyware for Business is a lightweight, scalable, and affordable solution a company’s IT department can operate via a central management console, employing it as a first or second line of defense. John Jost, Senior Sales and Marketing Manager for SUPERAntiSpyware (SAS), told us customers appreciate how well the platform works alongside other essential enterprise software. 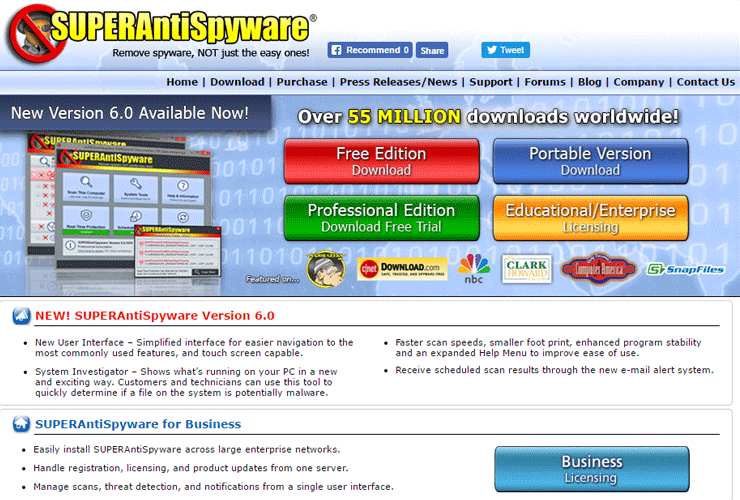 SUPERAntiSpyware has free, professional, and business editions that operate off the same robust scanning technology. Its team of engineers enjoy the daily challenge of detecting and removing harmful files from customer computers. SAS delivers the most relevant protection possible based on the types of attacks customers are seeing. Members of the SAS team are on the front lines daily finding the latest malware threats and preventing them from damaging their clients’ reputations. Users of SAS receive comprehensive scanning that alerts them to malware detected on their systems. By identifying the threats impacting customers, the team tries to adapt and focus its energy on where it’s needed most. The team detects millions of items every day across SAS’s various editions, and many of these items pose serious threats to computer systems. Geoff told us potentially unwanted programs (PUPs) have also been prevalent as some software companies will bundle additional applications into downloads. PUPs are often used to track web usage to sell information to advertisers. Some security software that protects enterprises can be intimidating to users. But SAS was created by developers with IT backgrounds and a focus on keeping it user-friendly, lightweight, and inexpensive. SAS for Business employs the same scanning engine found in the free and pro editions, but it gives IT departments a centralized solution to manage scan settings and notifications for multiple users. A scan in progress (left) and quarantined items (right) in the SAS for Business central management system. Portage Community Bank of Ravenna, Ohio, is a SAS customer, and its IT department has seen firsthand how agile and effective the business software can be in keeping every endpoint secure. After all, only one employee computer needs to be compromised to cause serious damage. The business platform operates on the same scanning engine as the other SAS platforms, so anything that’s detected out of the millions of files they see daily is removed as a threat. Malware and antivirus protection are essential to business operations. When customers make purchases with companies, they’re placing their trust in that business to keep their information out of the hands of criminals. If that trust is betrayed or even questioned, consumers will turn to other businesses where their confidence remains intact. The SUPERAntiSpyware team has been developing and refining its products for more than 10 years, ensuring its users’ computers remain clean. The platform’s centrally managed business solution ensures consumer confidence and builds on that relationship to help its business customers prosper and grow. While the SAS team derives its job satisfaction from the daily monitoring and removal of emerging malware threats, hearing from customers also goes a long way.